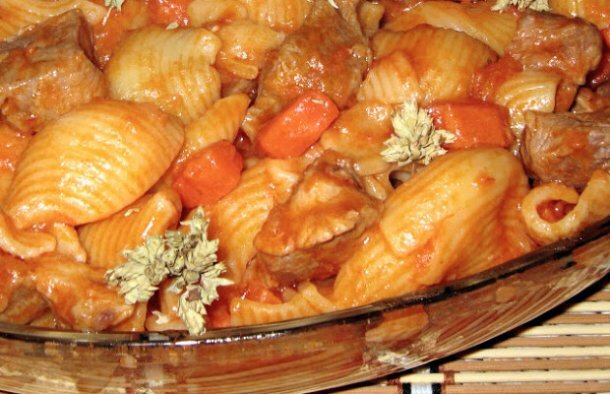 This Portuguese shell pasta with pork stew (molho de conchas com carne de porco) is delicious and makes a great meal for the whole family. Cut the meat into cubes and season with salt and pepper. Heat the olive oil and saute the onion, garlic and bay leaf. Add the meat and saute over low heat. Add the tomatoes and the tomato paste. Add the wine and the chicken broth and let it cook on low heat for about 15 minutes. Add the carrots, after 5 minutes, add the pasta. Mix everything well, cover the pan and cook for another 8 minutes. Remove it from the heat and let it stand for a bit (without removing the lid from the pan). Check for salt and pepper, add the oregano over it and serve. 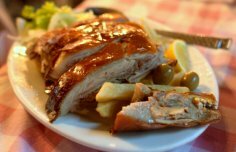 A traditional Portuguese recipe to accompany a good bottle of wine. 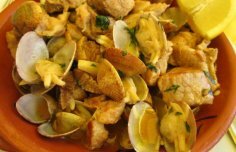 How to make the popular traditional dish, Portuguese pork with clams (carne de porco com ameijoas). A traditional, delicious and healthy Portuguese meal for the whole family (Cozido à Portuguesa).